The very idea of adding a skylight to your home can be exciting. It’s a feature that can completely change the appearance of a room because it infuses light, and adds a tremendous amount of character. There are even cost-saving opportunities with skylights because they can reduce your energy bill; a room with a skylight requires less electricity, especially during the daytime. There’s also the fact that natural light can make a room appear larger and more inviting. The key to reducing expenses when adding a skylight is to make sure you choose the right type of skylight, and use a professional roofing contractor. There are many features and materials from which to choose, and making the right decisions will determine whether or not your home is comfortable. Without thoughtful consideration, things can go awry, and your new skylight can become a nightmare. Given everything that’s involved, and the potential impact of a skylight, it’s important to ensure you have a good roofer that you can trust. Let’s delve into some of the considerations required when planning to install a skylight, and the various factors involved. There are many types of skylights, including glass, plastic, operable, fixed, flexible, tubular, large and small. You can also get skylights that have shades or blinds, as well as skylights that block UV sunlight. In fact, the options are practically endless. A good roofer will be familiar with the different types of materials available, and they will help you choose the features and size that’s right for you. This will prevent problems from occurring down the road, and it will also optimize the enjoyment of your skylight. When considering the installation of a skylight, keep in mind that you’ll need a room that’s either located under the roof or under an attic space that has not been finished. While a room right below the roof is often preferred, installing a skylight below an attic will require the installation of a skylight shaft through the attic. This allows the natural light from outside to flow through both the rooftop and attic. It’s a great plan if you don’t have a space directly under the roof. There are different types of skylight shafts that come in various shapes. For instance, a flared shaft shines light over a wider area than other shapes because it’s usually flared on all four sides. Other shapes typically have vertical sides and they only provide light directly below the shaft. A qualified roofer can provide more information about the different shapes of skylights, including which shape will work best for you based on your needs and wants. It’s important to understand the path of the sun because direct sun can have a tremendous impact on the amount of heat that enters a room. During the planning process, you’ll need to determine where to place the skylight based on the positioning of the sun in order to prevent the issue of having too much heat from direct sunlight in the summer. While this issue can be addressed with features like blinds, it’s still an important consideration. Blinds are a practical feature that’s often used when installing a skylight in a bedroom because they prevent an overwhelming amount of light in the morning. While a skylight in your bedroom offers an amazing view at night, too much light in the morning isn’t necessarily how everyone wants to start their day. As with any other window, it’s not just the blinds that you need to consider, there’s also the issue of maintenance. To ensure you’re able to maintain the beauty of the skylight, it’s necessary to make sure it’s accessible for cleaning. A good roofer will take all of the necessary measurements in advance to make a decision about placement. They will also understand issues like wind resistance and other regulatory considerations, especially since most cities require building permits for the installation of skylights. Many manufacturers offer both glass and plastic skylights. They are also available in single, double and triple glazing. Which option is best might very well depend on the weight, along with other factors specific to your home. For instance glass skylights can weigh twice as much as plastic skylights. The reason why some people choose plastic is because it’s lighter in weight, often more durable and tend to be more affordable. Plastic skylights are typically available in standard sizes, but they come in a variety of different styles, such as barrel-shaped, ridge-shaped, bubble, round and flat. If you’re someone who prefers a more sophisticated presentation, then glass might be the best option for you. It’s also a preferred choice by many because it tends to be scratch-resistant, and a lot of manufacturers offer glass skylights in different sizes. There’s a minimum standard for glass skylights that includes tempered glass with two layers. There’s also air space between the layers for the purpose of energy efficiency. As it relates to the double insulated and tempered glass, a low-emissivity coating is on the inside pane. The purpose is to help reduce the amount of heat that enters the room during warm months, but holds heat in during colder months. It also decreases the amount of UV rays. Another reason why tempered glass and a low-emissivity coating are important is because it can prevent damage to your décor, including your flooring, furniture and artwork. R-Value: The R-value is a measure of the insulation value of the materials used. It gauges how much resistance a material has to the flow of heat, and it’s typically focused on the glazing. Essentially, a high R-value means the skylight is well insulated. Generally speaking, skylights that have the highest R-values also have low-emissivity insulating glass. They also have argon in between the panes. 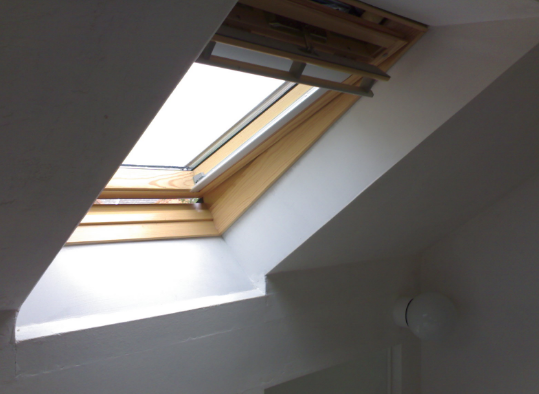 This type of skylight has double the amount of insulation as panes that are dual-glazed. U-Value: The U-value that a skylight receives is based on the frame, glazing and flow of heat through the skylight. The heat flow is measured on both sides of the skylight. A low U-value means the product is resistant to heat flow, so the lower the rating the better. Visible Light Transmittance (VLT): While not all manufacturers provide a VLT measurements, some do and it measures the amount of visible light that’s transmitted by a skylight. If your goal is to maximize the amount of light that flows into the room, then you’ll want a high VLT rating. On the flip side, there are some features that lower the VLT rating, such as tinted glazing on the glass. UV Blockage: As you might have guessed, the amount of UV rays that’s blocked by glazing is communicated with the UV blockage rating provided by most manufacturers. Shading Coefficient: If you want to know the amount of solar heat gain through the glass of a skylight, the shading coefficient rating is the number that you’ll want to assess. The glazing is compared to double strength glass and the lower the number, the lower the solar heat gain. And remember, make sure you use a professional roofing contractor. We’re here to help you make the right decision about a skylight for your home.